Ḥatam Sofer ʻal hilkhot Rosh ḥodesh, Pesaḥ u-Sefirat ha-ʻomer: asher niḳbetsu mi-tokh teshuvotaṿ, pisḳaṿ, minhagaṿ u-derashotaṿ shel Baʻal ha-Ḥatam Sofer. Hagadat he-Ḥatam Sofer: imrot ḳodesh, beʼurim ṿe-ḥidushim, meshalim meʼalfim ṿe-sipurim muflaʼim meluḳaṭim mi-sifre de-ve rav ... he-Ḥatam Sofer, z. ts. ṿe-ḳ.l. Nitsotse Ḥatam Sofer: Shirat Mosheh : ʻim beʼurim u-meḳorot : ʻal ḥag ha-Sukot, Shem. ʻa. 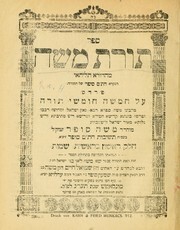 ṿe-Simḥat Torah. Are you sure you want to remove Sofer, Moses from your list?